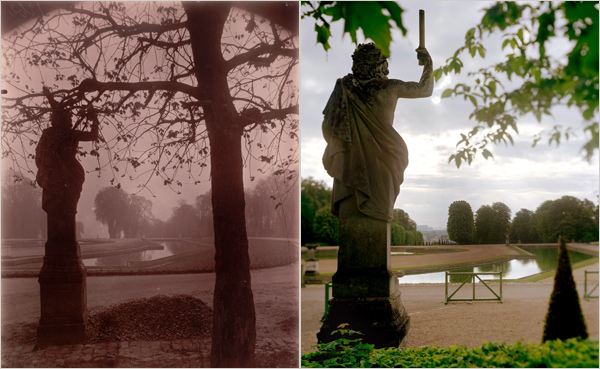 A terrific walk around the Paris of Atget is suggested by an article in the New York Times Travel section today, with a lot of history described through the lens of Atget. Some of Atget’s loveliest photographs capture the grand homes that line the Seine, whether as the focus of a picture or as part of a broader setting in which they vie for attention with the trees and water. At the foot of Île St.-Louis is the Hôtel Lambert with its big wooden doors and door knockers. Finished in 1644, it has been home to a number of wealthy Parisians, from the Rothschilds to the current owner: a Qatari prince who reportedly paid around $100 million three years ago to acquire it. The Hôtel Lambert so dominates the Rue St.-Louis-en-l’Île that there is little room for other homes in Atget’s photographs of it, which lend the opulent property a majestic grandeur. Some of the current offerings in London photography shows are described today in the Financial Times: Some snippets ..
At Autograph in London’s Rivington Place, the Ghanaian photographer James Barnor is presented in a charming exhibition which shows what well-directed public funding can do. Covering a similarly wide range of a single artist’s trajectory is an exhibition at the Diemar/Noble gallery of the Mexican Manuel Alvarez Bravo. The show takes its title from a picture called "Quetzalcoatl", a landscape study in which a tree takes on the writhing twist of that snake deity. At the more contemporary end of the scale is Native by photographer Mona Kuhn, which has transferred from Flowers in New York to its London gallery. Kuhn returned to Brazil after many years elsewhere to make a series purporting to examine the kind of life she might have had had she stayed. O’Neill is a celebrity photographer and it is easy to think less of his work for that. So many photographers do no more than reproduce an "image" which has already been carefully crafted by marketing people and stylists, but in O’Neill’s prime he seems to have had a kind of snapper’s intimacy that defeated marketing control.